As the end of the school year approaches, I can easily say that #GeniusHour was one of the projects I’m proudest of. My students investigated their passions with grit and curiosity, researched, wrote, and created products that they were proud of. Often, I’m proud of the work and want to share it. This time, many of them wanted to share it, too, and that was incredible rewarding. On their final blog posts and in their reflections, students demonstrated that they, too, understood the power of their work and were proud of their accomplishments. Now it’s time to see what they learned and created. In this post, I will share my students’ genius. I’ve highlighted a handful of projects below, with links to their blogs and excerpts from some of the work. Find all 45 projects with all of the students’ work at . Lauren’s project was featured here last month in Redesigning Learning Spaces. For last year’s student products, read 1st Time #20Time: Sharing Student Products. Then, find more of my recent writing on Genius Hour with What Students Think Part 1 and Part 2 or My Questions About #GeniusHour. To find all of my writing on #20Time and #GeniusHour, click here. For my students’ blogs and work, visit geniushour.aschoenbart.com. Emma wanted to learn about heroes and stories. What makes a good story? She investigated archetypes and the monomyth, reading all of the classic epic hero stories. Find Emma’s blog here and the start to her own original story in her project. Below is the presentation Emma shared in class about her research and creation. In her blog, Emma wrote: “Our time for Genius Hour is almost up, and so my journey through the monomyth must come to a close. Looking back to the very beginning of Genius Hour, I have to admit I'm surprised. I started this project with no clue as to where it would end up. And now? I'm gearing up to write a novel. Steven researched the effects of physical activity on brain health and did a tremendous job of sharing his work with authentic audiences. He surveyed students to learn about their ideas, conducted research, and then presented it to health classes in our school. Eric likes heavy metal music. But he thought many people really didn’t understand it. To dispel preconceived notions, he researched the culture and history. He played selected songs for students and interviewed them about their reactions and thoughts. He then created videos of his interviews to compare and contrast to the research he found. Melanie chose a topic that’s important to many teenagers: sleep. She often complained about being too busy or tired but was quick to realize that the amount of sleep that teenagers get is a problem. She researched the problem and conducted her own action research, too, synthesizing her findings in a presentation. Find Melanie’s blog hereand her presentation below. Helen is an athlete. She plays on Ossining’s girls basketball team but had some complaints about sports clothing for women. She argued that female athletes are often criticized for their clothes but the bigger issue is that the fashion design world did not meet the community’s needs. She surveyed other athletes about athletic clothes and fashion design, researched the issue, and interviewed her team. Then, she created this slideshowand a video. 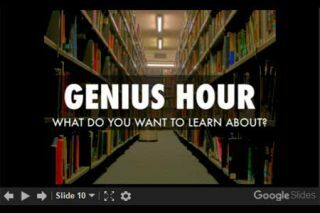 Check out the Genius Hour Fair at geniushourfair.com, which calls itself “an online showcase of Genius Hour projects open to classes and students aged 9 to 16 years old.” To end the school year, I’m going to have some of my students enter! How do you showcase student work in your classroom? What products and projects are you most proud of? Share in the comments below or on Twitter.